Multi-instance tasks allow you to run an Azure Batch task on multiple compute nodes simultaneously. These tasks enable high performance computing scenarios like Message Passing Interface (MPI) applications in Batch. In this article, you learn how to execute multi-instance tasks using the Batch .NET library. While the examples in this article focus on Batch .NET, MS-MPI, and Windows compute nodes, the multi-instance task concepts discussed here are applicable to other platforms and technologies (Python and Intel MPI on Linux nodes, for example). In Batch, each task is normally executed on a single compute node--you submit multiple tasks to a job, and the Batch service schedules each task for execution on a node. However, by configuring a task's multi-instance settings, you tell Batch to instead create one primary task and several subtasks that are then executed on multiple nodes. The Batch service creates one primary and several subtasks based on the multi-instance settings. The total number of tasks (primary plus all subtasks) matches the number of instances (compute nodes) you specify in the multi-instance settings. Batch designates one of the compute nodes as the master, and schedules the primary task to execute on the master. It schedules the subtasks to execute on the remainder of the compute nodes allocated to the multi-instance task, one subtask per node. The primary and all subtasks download any common resource files you specify in the multi-instance settings. After the common resource files have been downloaded, the primary and subtasks execute the coordination command you specify in the multi-instance settings. The coordination command is typically used to prepare nodes for executing the task. This can include starting background services (such as Microsoft MPI's smpd.exe) and verifying that the nodes are ready to process inter-node messages. The primary task executes the application command on the master node after the coordination command has been completed successfully by the primary and all subtasks. The application command is the command line of the multi-instance task itself, and is executed only by the primary task. In an MS-MPI-based solution, this is where you execute your MPI-enabled application using mpiexec.exe. 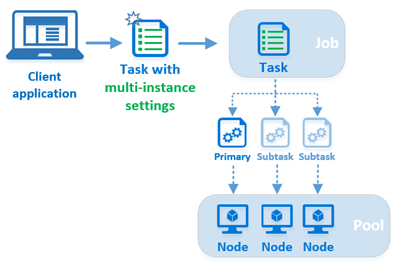 Though it is functionally distinct, the "multi-instance task" is not a unique task type like the StartTask or JobPreparationTask. The multi-instance task is simply a standard Batch task (CloudTask in Batch .NET) whose multi-instance settings have been configured. In this article, we refer to this as the multi-instance task. Multi-instance tasks require a pool with inter-node communication enabled, and with concurrent task execution disabled. To disable concurrent task execution, set the CloudPool.MaxTasksPerComputeNode property to 1. Batch limits the size of a pool that has inter-node communication enabled. This code snippet shows how to create a pool for multi-instance tasks using the Batch .NET library. // must run only one task at a time. If you try to run a multi-instance task in a pool with internode communication disabled, or with a maxTasksPerNode value greater than 1, the task is never scheduled--it remains indefinitely in the "active" state. To run MPI applications with a multi-instance task, you first need to install an MPI implementation (MS-MPI or Intel MPI, for example) on the compute nodes in the pool. This is a good time to use a StartTask, which executes whenever a node joins a pool, or is restarted. This code snippet creates a StartTask that specifies the MS-MPI setup package as a resource file. The start task's command line is executed after the resource file is downloaded to the node. In this case, the command line performs an unattended install of MS-MPI. // the nodes as they join the pool (or when they are restarted). // the pool and its compute nodes. When you choose an RDMA-capable size such as A9 for the compute nodes in your Batch pool, your MPI application can take advantage of Azure's high-performance, low-latency remote direct memory access (RDMA) network. To take advantage of RDMA on Linux compute nodes, you must use Intel MPI on the nodes. Now that we've covered the pool requirements and MPI package installation, let's create the multi-instance task. In this snippet, we create a standard CloudTask, then configure its MultiInstanceSettings property. As mentioned earlier, the multi-instance task is not a distinct task type, but a standard Batch task configured with multi-instance settings. // Create the multi-instance task. Its command line is the "application command"
// subtasks execute the CoordinationCommandLine. // the primary and all subtasks. // scheduling them for execution on the nodes. When you create the multi-instance settings for a task, you specify the number of compute nodes that are to execute the task. When you submit the task to a job, the Batch service creates one primary task and enough subtasks that together match the number of nodes you specified. These tasks are assigned an integer id in the range of 0 to numberOfInstances - 1. The task with id 0 is the primary task, and all other ids are subtasks. For example, if you create the following multi-instance settings for a task, the primary task would have an id of 0, and the subtasks would have ids 1 through 9. When you submit a multi-instance task, the Batch service designates one of the compute nodes as the "master" node, and schedules the primary task to execute on the master node. The subtasks are scheduled to execute on the remainder of the nodes allocated to the multi-instance task. The coordination command is executed by both the primary and subtasks. Note the use of start in this coordination command. This is required because the smpd.exe application does not return immediately after execution. Without the use of the start command, this coordination command would not return, and would therefore block the application command from running. Once the primary task and all subtasks have finished executing the coordination command, the multi-instance task's command line is executed by the primary task only. We call this the application command to distinguish it from the coordination command. Because MS-MPI's mpiexec.exe uses the CCP_NODES variable by default (see Environment variables) the example application command line above excludes it. Batch creates several environment variables specific to multi-instance tasks on the compute nodes allocated to a multi-instance task. Your coordination and application command lines can reference these environment variables, as can the scripts and programs they execute. For full details on these and the other Batch compute node environment variables, including their contents and visibility, see Compute node environment variables. The Batch Linux MPI code sample contains an example of how several of these environment variables can be used. The coordination-cmd Bash script downloads common application and input files from Azure Storage, enables a Network File System (NFS) share on the master node, and configures the other nodes allocated to the multi-instance task as NFS clients. There are two sets of resource files to consider for multi-instance tasks: common resource files that all tasks download (both primary and subtasks), and the resource files specified for the multi-instance task itself, which only the primary task downloads. You can specify one or more common resource files in the multi-instance settings for a task. These common resource files are downloaded from Azure Storage into each node's task shared directory by the primary and all subtasks. You can access the task shared directory from application and coordination command lines by using the AZ_BATCH_TASK_SHARED_DIR environment variable. The AZ_BATCH_TASK_SHARED_DIR path is identical on every node allocated to the multi-instance task, thus you can share a single coordination command between the primary and all subtasks. Batch does not "share" the directory in a remote access sense, but you can use it as a mount or share point as mentioned earlier in the tip on environment variables. Resource files that you specify for the multi-instance task itself are downloaded to the task's working directory, AZ_BATCH_TASK_WORKING_DIR, by default. As mentioned, in contrast to common resource files, only the primary task downloads resource files specified for the multi-instance task itself. Always use the environment variables AZ_BATCH_TASK_SHARED_DIR and AZ_BATCH_TASK_WORKING_DIR to refer to these directories in your command lines. Do not attempt to construct the paths manually. The lifetime of the primary task controls the lifetime of the entire multi-instance task. When the primary exits, all of the subtasks are terminated. The exit code of the primary is the exit code of the task, and is therefore used to determine the success or failure of the task for retry purposes. If any of the subtasks fail, exiting with a non-zero return code, for example, the entire multi-instance task fails. The multi-instance task is then terminated and retried, up to its retry limit. When you delete a multi-instance task, the primary and all subtasks are also deleted by the Batch service. All subtask directories and their files are deleted from the compute nodes, just as for a standard task. TaskConstraints for a multi-instance task, such as the MaxTaskRetryCount, MaxWallClockTime, and RetentionTime properties, are honored as they are for a standard task, and apply to the primary and all subtasks. However, if you change the RetentionTime property after adding the multi-instance task to the job, this change is applied only to the primary task. All of the subtasks continue to use the original RetentionTime. A compute node's recent task list reflects the id of a subtask if the recent task was part of a multi-instance task. To obtain information on subtasks by using the Batch .NET library, call the CloudTask.ListSubtasks method. This method returns information on all subtasks, and information about the compute node that executed the tasks. From this information, you can determine each subtask's root directory, the pool id, its current state, exit code, and more. You can use this information in combination with the PoolOperations.GetNodeFile method to obtain the subtask's files. Note that this method does not return information for the primary task (id 0). Unless otherwise stated, Batch .NET methods that operate on the multi-instance CloudTask itself apply only to the primary task. For example, when you call the CloudTask.ListNodeFiles method on a multi-instance task, only the primary task's files are returned. The following code snippet shows how to obtain subtask information, as well as request file contents from the nodes on which they executed. The MultiInstanceTasks code sample on GitHub demonstrates how to use a multi-instance task to run an MS-MPI application on Batch compute nodes. Follow the steps in Preparation and Execution to run the sample. Follow the first two steps in How to compile and run a simple MS-MPI program. This satisfies the prerequisites for the following step. Build a Release version of the MPIHelloWorld sample MPI program. This is the program that will be run on compute nodes by the multi-instance task. Create a zip file containing MPIHelloWorld.exe (which you built step 2) and MSMpiSetup.exe (which you downloaded step 1). You'll upload this zip file as an application package in the next step. Use the Azure portal to create a Batch application called "MPIHelloWorld", and specify the zip file you created in the previous step as version "1.0" of the application package. See Upload and manage applications for more information. Build a Release version of MPIHelloWorld.exe so that you don't have to include any additional dependencies (for example, msvcp140d.dll or vcruntime140d.dll) in your application package. Download the azure-batch-samples from GitHub. Enter your Batch and Storage account credentials in AccountSettings.settings in the Microsoft.Azure.Batch.Samples.Common project. Build and run the MultiInstanceTasks solution to execute the MPI sample application on compute nodes in a Batch pool. Optional: Use the Azure portal or Batch Explorer to examine the sample pool, job, and task ("MultiInstanceSamplePool", "MultiInstanceSampleJob", "MultiInstanceSampleTask") before you delete the resources. You can download Visual Studio Community for free if you do not have Visual Studio. The Microsoft HPC & Azure Batch Team blog discusses MPI support for Linux on Azure Batch, and includes information on using OpenFOAM with Batch. You can find Python code samples for the OpenFOAM example on GitHub. Learn how to create pools of Linux compute nodes for use in your Azure Batch MPI solutions.